Florint » It’s a wrap: the packaging specialists of Dillewijn Zwapak are joining Florint as a partner! It’s a wrap: the packaging specialists of Dillewijn Zwapak are joining Florint as a partner! Remember the time when we wrapped our flowers in old newspapers for protection? Packaging has come a long way, hasn’t it? With that in mind, International Florist Organisation Florint happily welcomes a new partner organisation today: Dillewijn Zwapak, famous for its first-class packaging solutions for flower and plant products! Competition from other flower retail outlets, particularly the supermarkets, keeps increasing in most countries. More than ever, therefore, it is essential for florists to distinguish themselves as more than mere sellers of bunches of flowers. Skill in floral arrangement obviously remains vital. But other important elements help set us apart too, and give consumers a good reason to keep buying from the florist: good customer service, proper flower care, as well as beautiful packaging that adds real value to a bouquet! Dillewijn Zwapak has excelled at just that, for the entire 75 years of its existence. The company, part of the international Van Dillewijn Group, has successfully conquered the world with its clever and decorative packing solutions: everything from film and paper on rolls, sheets and sleeves, to boxes, glassware, picks, bags, baskets and countless decorative materials. Every single item is designed by the company’s own studio team. And they gladly do tailor-made, customised products in case you have specific desires along those lines! Florists may well recognise the company from its popular Cash & Carries at the Aalsmeer and Naaldwijk flower auctions, or its state-of-the-art online webshop (click here to have a look!). Dillewijn Zwapak’s relaunched website offers responsive functionality and easy search, filter, display and payment options: making for a very smooth browsing and ordering process. Suffice to say, Florint is happy to have the passion and expertise of Dillewijn Zwapak on board. We believe in the added value of effective and eye-catching packaging, and look forward to thinking of other creative ways to work together on behalf of florists. 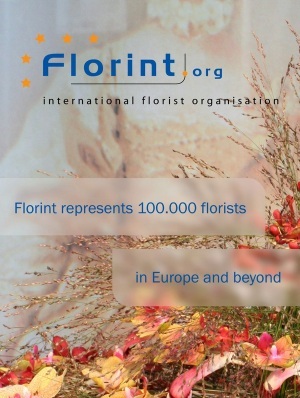 Ever since 1956, International Florist Organisation Florint is an umbrella organisation for the industry, fostering the professionalisation and prosperity of the flower sector. We are active in many domains: from lobbying the EU for favourable legislation, to organising the European Floristry Championships, to pushing for optimal floristry education. We help organise and politically represent florist associations in 20 countries – our valued members – and work together with many prominent sector companies. Greater prosperity for retail florists and the flower industry is the end goal. We are very proud to welcome Dillewijn Zwapak among those sector partners today!